Enjoy remote northern Minnesota’s lakes and wilderness. 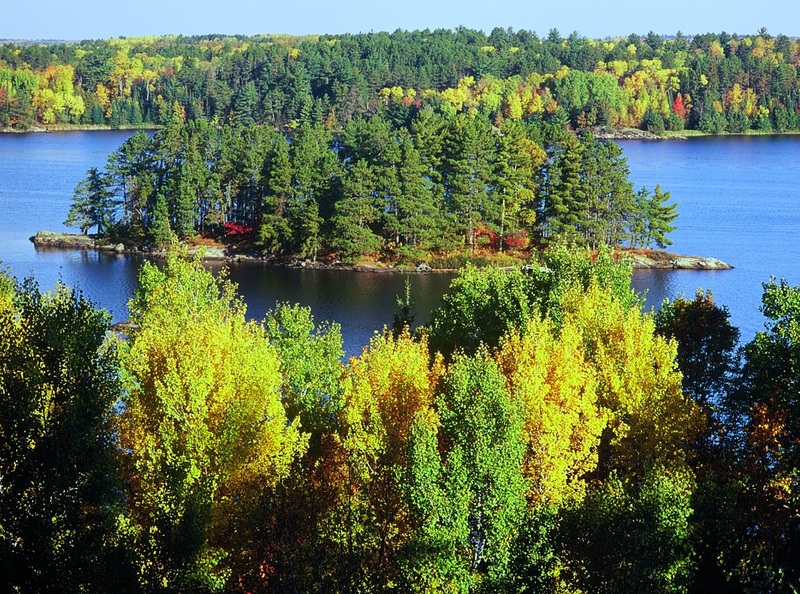 Voyageurs National Park is a 220,000 acre wilderness in the North Woods of Minnesota established in 1975. It is a water-based park encompassing 84,000 acres of water, 1000 forested islands and 600 miles of rocky shoreline surroudning four large lakes. The park is popular with boaters, fishermen, canoeists and kayakers. The demand for beaver pelts originally brought European fur traders to the area in the 17th and 18th century. Logging, gold and commercial fishing brought people to the area prior to its dedication as a park. It is now Minnesota’s only national park, welcoming approximately 240,000 visitors to the area every year. Voyageurs is located on the western end of a series of federally protected areas, five hours north of Minneapolis and St. Paul. To the east is Superior National Forest and the Boundary Waters Canoe Area Wilderness. The 55 mile northern boundary of Voyageurs is the international boundary with Canada. Voyageur is also known for its incredible wildlife, including bald eagles, loon and moose. It is also one of only two national parks with an indigenous population of the Eastern timber wolf in the continental United States. The Minnesota legislature first proposed the area as a national park in 1891, more than eighty years before it would be declared one. It would gain momentum in the 1960s with the establishment of the Voyageurs National Park Association in 1965. President Richard Nixon signed the legislation authorizing Voyageurs in 1971 and the park was officially established in 1975. Ebel’s: They have ten styles of boats ranging from Voyageur 36′ which is available for 2-3 persons to the 65′ Series which provides accommodations for up to 12 persons in the five state rooms and three bathrooms. Ebel’s is located on Ash River which is south of Sullivan Bay (southeast of Kabetogama Lake). Voyagaire Lodge & Houseboats has five types of houseboats available for rent ranging from the Suncruiser with three double beds to the 550 Voyagaire (four private staterooms, two baths and an 8 person hot tub). Voyagaire Lodge is located on Crane Lake south of San Point Lake. Rainy Lake Houseboats: If you want to start near the northwest corner of the park, you should consider starting at this houseboat rental location off Rainy Lake north of Black Bay. There are nine houseboat styles available starting at The Honeymooner (37′ accommodating 2 people) and ending at the 62′ Chairman II. For an overnight stay with a Houseboat in Voyageurs National Park, you will need to get a Houseboat Permit. A vessel needs a Houseboat Permit if it has on-board sleeping facilities, cooking facilities and an approved marine sanitation device. The permit must be on display at the back of the vehicle. There are 114 sites for Houseboats to stay overnight on Rainy Lake, Namakan Lake, Kabetogama Lake and Sand Point Lake. Houseboats may also stay at undesignated sites if they are located 200+ yards from any overnight visitor or any developed site/structure. Many outfitters, resorts and motels have canoes available for rents. This includes Voyagaire Lodge, Arrowhead Lodge and Northern Lights Resort & Outfitting. Experience world class walleye, smallmouth bass, crappie and northern pike inside the Voyageur National Park boundaries. For those not familiar with the area, there are fishing guides available for Crane Lake, Rainy Lake, Namakan Lake and Lake Kabetogama. In the winter, ice fishing is popular. In the winter when conditions allow, the National Park Service opens one or two ice roads across Rainy Lake for cars and trucks of less than 7,000 pounds gross vehicle weight. The ice roads allow vehicles to travel up to 30 miles per hour and park alongside the road to enjoy skiing, snowshoeing or ice fishing. Snowmobiles are not allowed on the road. The ice roads usually close around mid-March. There are about a dozen hiking trails in Voyageurs National Park that are accessible by car from land and another half dozen trails that are accessible by boat. In total, the park includes more than 52 miles of hiking trails and 110 miles of groomed snowmobile trails in the winter. Although it is primarily a water park, there are a few lodging options on the outskirts of the park and in International Falls.